Capture stunning photos and video in both 2D or 3D with the world's first, interchangeable lens that can capture both still images and video in either dimension. The 45mm f1.8 2D/3D lens has a switch located on the side of the lens, giving users a one-touch option to change between 2D and 3D shooting. While recording in 2D, the lens has an aperture of f1.8 which allows users to capture exceptional images, even in low-light situations. While in 3D, users can capture either still photos or Full HD video. The intuitive I-Function feature gives users one-touch access to all your camera's manual settings. Adjust the aperture, shutter speed and more with just a twist of the lens while previewing the image in real-time. Plus since it's incredibly lightweight, you can take it with you anywhere. 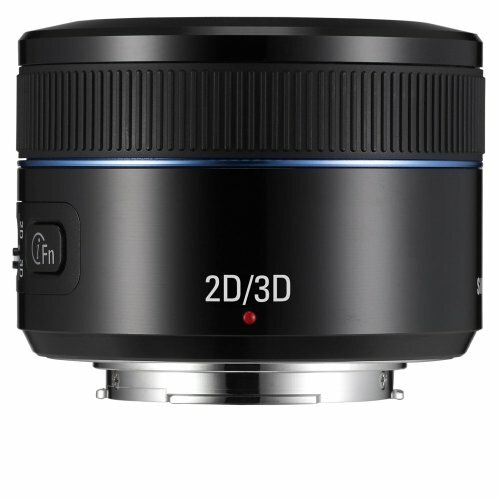 This 45mm f1.8 2D/3D lens is compatible with the Samsung NX300 Compact System Cameras.